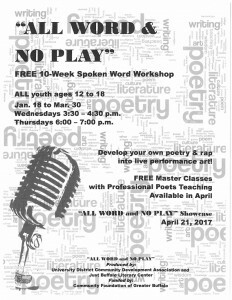 “All Word and No Play” is a free, ten-week spoken word workshop for youth, male and female, ages 12-18 running January 18 through March 30, 2017 at the Gloria J. Parks Community Center, 3242 Main Street, Buffalo. The University District Community Development Association (UDCDA) and Just Buffalo Literary Center are partnering to offer the series with support from the Community Foundation of Greater Buffalo. Workshops begin January 18 and continue on Wednesday afternoons from 3:30-4:30 p.m. and Thursday evenings from 6:00-7:00 p.m. through March 30. 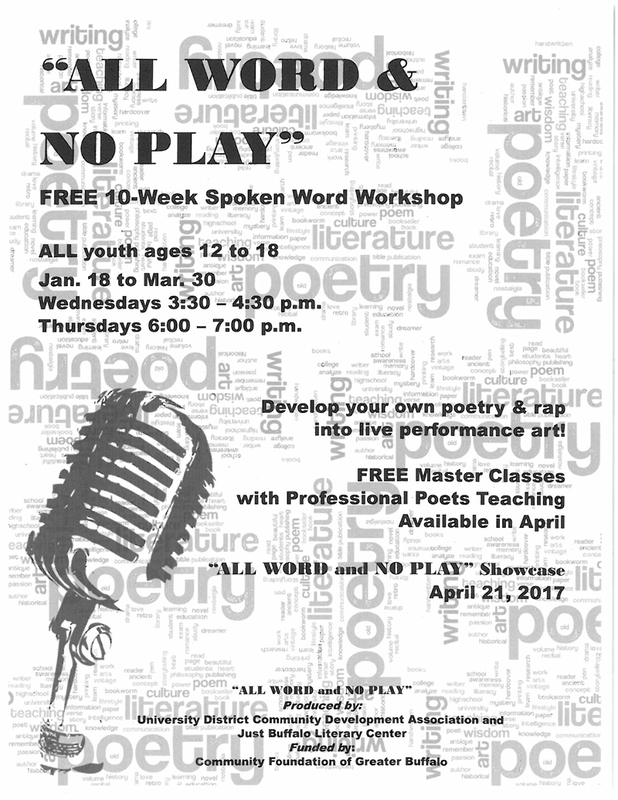 In addition to the workshops, free master classes will be offered by local performance poets Benjamin Brindise and Dayatra Hassan on two Saturdays, April 1 and 8, from 2:00-4:00 p.m.
All workshop participants will be invited to take part in the “All Word and No Play” showcase performance on Friday, April 21, at 7:00 p.m.
For more information or to register, call 716-832-1010. – Sat., April 1, 2 – 4 p.m.
– Sat., April 8, 2 – 4 p.m.